Mission: RAD’s mission is to make a positive impact in the lives of individuals and families with autism every day. Vision: RAD envisions a community where every individual with autism has access to education, care, activities and medical resources necessary to lead a happy and fulfilled life. I grew up with a younger brother with severe Autism Spectrum Disorder. We are only one and a half years apart, so I have always felt extremely close to him. Initially, he was a remarkably high functioning child and was even able to do second grade math at the age of 4 years old. We used to socialize and play together and were nearly inseparable. When he turned five, everything changed for me and my family. We took a cruise to the Western Caribbean and visited countries such as Belize and Guatemala. When we returned, my brother developed an extremely high fever for about a week, leading to a progressive decline in functioning. Over the course of 1 month, he lost almost all of his abilities. He eventually lost his ability to speak, lost bowel and bladder control and developed severe anxiety. He was hospitalized and despite undergoing every possible test and seeing every possible consultant, no one could explain what happened to him. For me, this was an overwhelming development as I lost my brother, my friend, and my playmate. My family was devastated as my parents tried to figure out what occurred and how we would work to get my brother back. All of the doctors that treated my brother suggested intensive therapy to aim for recovery. The challenge for us, was actually finding the resources, therapies and treatment needed for my brother here in Southern Nevada. From 2009 onwards, we contacted as many therapists, specialists and doctors as we could. Many doctors suggested medication to treat the severe anxiety that my brother developed. This led to another obstacle. My brother is different. He metabolizes the medication that he needs in a different way compared to everyone else. Because of this, we never know how he will react. He has been on over twenty different medications to try to help him, but he reacts to everything and was unable to take medication. He developed akathisia (chemical torture to most medications) and watching him scream and cry every time he reacted was the most difficult experience for me. We spent no time as a family because my brother could not stay in the house due to his anxiety. He literally lived in the car as that was the only place where he was not anxious or crying. My parents spent most of those initial five years after the incident, driving him around rather than spending time with us. He could not even attend school regularly due to his condition. We spent a lot of resources and time on intensive therapy and treatment. We have seen some recovery of his function, but he was never able to fully reacquire his abilities. The extreme lack of available resources in Southern Nevada for children with autism was a contributing factor in my brother’s inability to fully recoup his functioning. Seeing my family struggle through this process over the years led me to questioning what I could do to help my brother and other children like him. I started researching other organizations and educated myself on what was available and what was lacking. I started thinking about how I could make a Real Difference in the lives of children with Autism. Over the past year, I have been working on organizing and establishing RAD: making a Real Autism Difference. 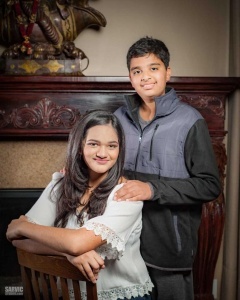 For my 16th birthday, I decided to launch RAD to start my journey in helping other children who have been diagnosed with Autism Spectrum Disorder.